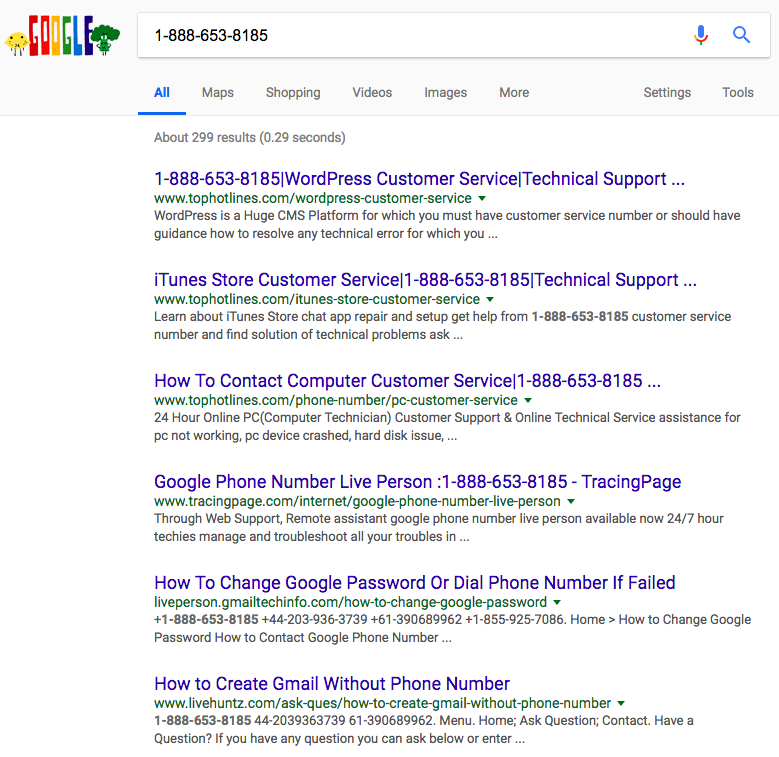 WARNING: Many TDS Readers have contacted us in April, 2019 to say that they are getting scam calls that appear to be from a real Apple Computer tech support number but the calls are scammers! Here are two voice messages left on victim’s phones by an automated scam message. The first one was left on April 15, 2019. The recipient is asked to call 888-254-7555. Lots of people reporting this number as unsafe! In late August, 2017 we published an article about the many fake Amazon Customer Support phone numbers showing up on forums all over the Internet. (Visit: Amazon Customer Support…NOT!) 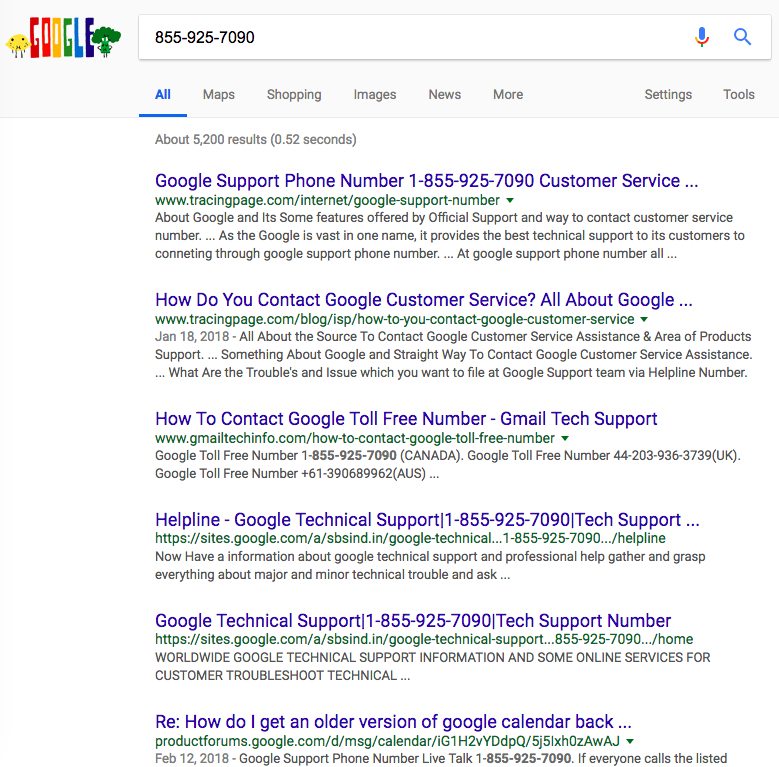 Most importantly, Google is being manipulated so that these fake phone numbers are showing up high in search results. People who call these numbers are victimized by criminals in multiple ways, especially financially. Since posting our Amazon article in late August, we’ve found 26 phony numbers. 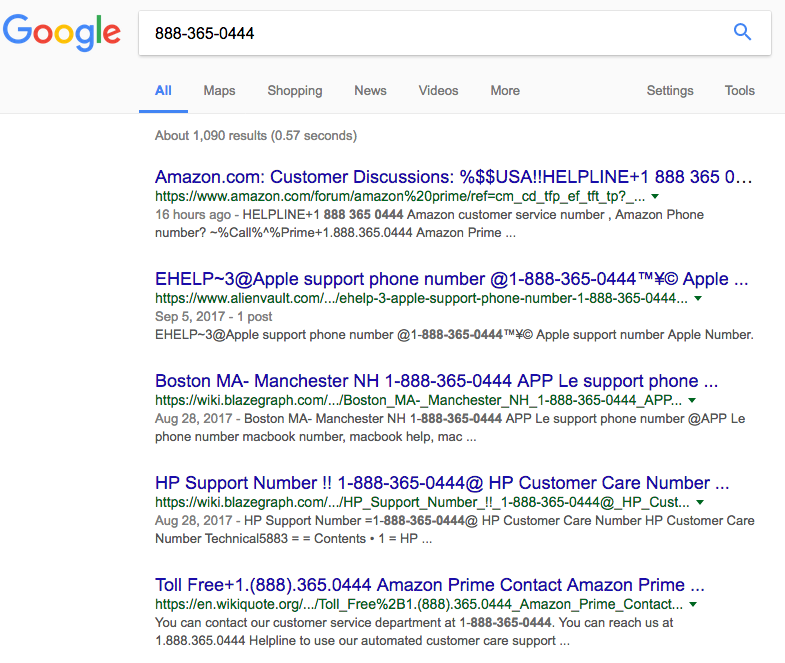 However, on September 17 while researching another new fake Amazon phone number we came across this Google result below. 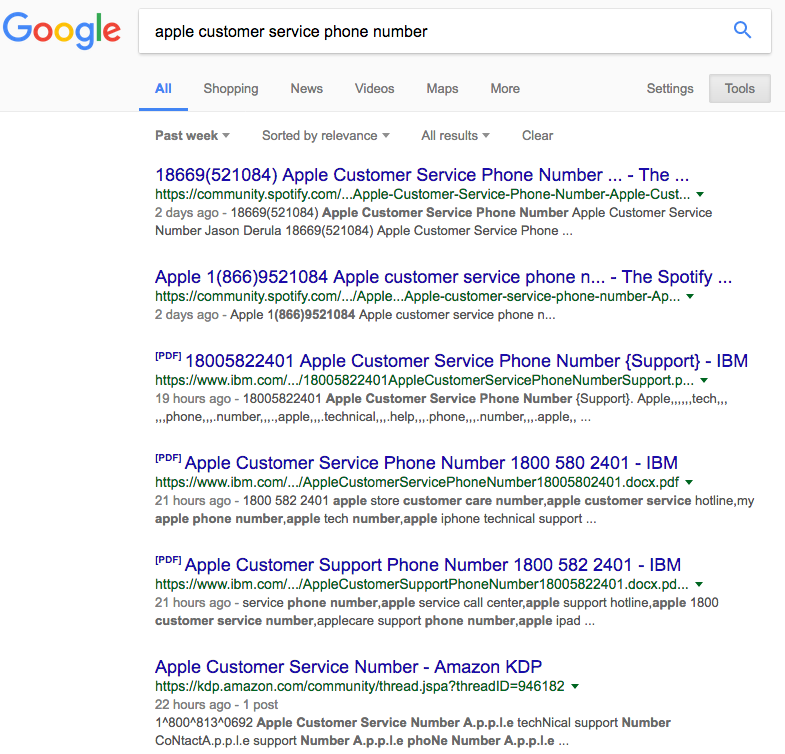 In all, we were able to locate 10 fake Apple customer service numbers and a fake website being pushed out to consumers and showing up high in Google searches. If these phony numbers are being used by criminals like the Amazon phone numbers, the fake support staff will trick consumers into giving control of their computers and Apple accounts to criminals who will steal personal information and make purchases using the consumer’s account. (These numbers were reported to us by a TDS reader. The criminals calling this man spoofed Apple’s phone number so the call appeared to come from the legitimate Apple number. Apple Computer will never call you to say your phone or computer has been hacked. 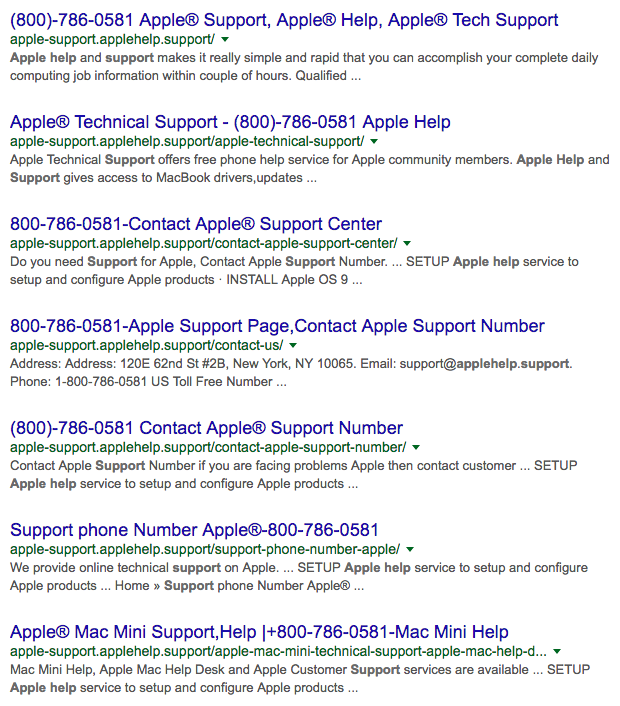 In their effort to make this domain seem even more legitimate, they have added a sub-domain called “apple-support” to produce the domain apple-support.applehelp.support. If you look in the very last link in the graphic above, you’ll see “apple” mentioned 4 times and “mac” twice! But it is all a lie! This is NOT Apple’s website or Apple’s customer support number. A WHOIS lookup of Apple.com shows that it is registered to Apple, Inc of Cupertino, California since 1987. However, if you run a WHOIS lookup of applehelp.support you find that it was registered in October, 2015 through a private proxy service of Arizona and the website title is “Hostmonster.” Don’t believe this phony-baloney website! “I am frustrated that I got caught up with this as I am usually pretty cautious. My grandson was vacationing with us in Myrtle Beach and Saturday night his iPhone 7 had no service and no bars suddenly. The next morning it wasn’t better but had some use in between. So we called his parents back home and they called Apple, told them what happened, got a case # and told us to call and tell them we had a case #. His parents told us to call 1-800-MYAPPLE. Unfortunately my grandson didn’t know how to interpret that so he googled it on his phone and got the 805 area code number [SCAM PHONE NUMBER: 805-554-0313]. That’s how this idiot got ahold of us. He told us to go to a local grocery store, gas station, etc and buy an iTunes card for $100 and call him back. I didn’t feel things were right so I called my son who suggested that we call the 1-800-MYAPPLE number again. My grandson called and we got the same guy (however I did not realize at the time that my grandson didn’t really call the 1800-MYAPPLE number! ) so when he called it again it was the scammer. He started giving us different names and he had a very Indian accent. We kept asking for someone who spoke english to the point where he was mocking us. My husband was in the hospital here while on vacation, so I was already stressed and was starting to flip out and ask for a manager. I am sure the same man came back on the phone and was giving me a hard time again. This time I asked for his name and phone number and that is when the 800 number came up. He gave me 800-435-3736 [ANOTHER SCAM PHONE NUMBER!] After 1 hr 33 minutes I finally hung up on him only for him to keep calling me back all day and night. He even called today while we were at the hospital and I took the call thinking it was the trailer repair people. I ranted at him again and finally hung up. He said he didn’t take the iTunes card since we still had it BUT he took the number. The day before he had asked me how I paid for it so he could “refund me” and so he wanted my charge card. Fortunately I did not give him any of that information BUT I was afraid he could trace the information from the iTunes card number. I called Discover Card and my card has only been used for what I have charged to it. My son then called the original scam number and talked to 5 or 6 different people (they gave different names but he was sure it was the same scumbag) and on the 6th phone call the man hung up on my son. Good question Linda! Our government’s response to online fraud is terribly inadequate. For example, WHY do our laws allow certain technologies to be used that make it not only possible, but EASY for fraudsters to target Americans? For example, WHY do the Phone Carriers like Verizon, AT&T, and Sprint make it possible for phone numbers to be spoofed? If phone calls are being routed to India, why not inform the consumer in a brief message that this call is connecting to India, or China, or wherever? We need better laws to protect consumers AND insist that our own tech companies do a better job to protect U.S. citizens!